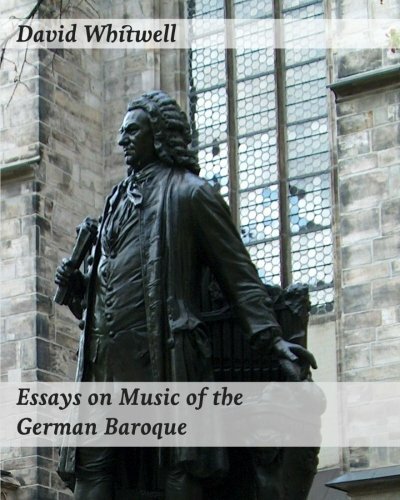 With the exception of the new form, Opera, the previous two centuries of musicology have tended to present the Baroque Period, 1600-1750, as a period of functional, even mechanical, music.&nbsp;The contemporary discussion in this volume will help the reader understand that nothing could be further from the truth.&nbsp;The great interest of most musicians living in the Baroque Period was the role of emotion in music both in composition and in performance.&nbsp;The role of all idioms of performance, including especially improvisation, were directly associated with the goal of increased communication of emotion.&nbsp;We believe these pages will suggest to the reader that no player of the Baroque Period ever just played what he saw on paper, and we don't believe anyone should do so today. Dr. David Whitwell is a graduate (&#x201c;with distinction&#x201d;) of the University of Michigan and the Catholic University of America, Washington D.C. (Ph.D., Musicology, Distinguished Alumni Award, 2000) and has studied conducting with Eugene Ormandy and at the Akademie f&uuml;r Musik, Vienna. Dr.Whitwell has been a guest professor in one hundred different universities and conservatories throughout the United States and in twenty-three foreign countries (most recently in China, in an elite school housed in the Forbidden City). Guest conducting experiences have included the Philadelphia Orchestra, Seattle Symphony Orchestra, the Czech Radio Orchestras of Brno and Bratislava, The National Youth Orchestra of Israel, as well as resident wind ensembles in Russia, Israel, Austria, Switzerland, Germany, England, Wales, The Netherlands, Portugal, Peru, Korea, Japan, Taiwan, Canada and the United States. Dr. Whitwell&#x2019;s publications include more than 127 articles on wind literature including publications in Music and Letters (London), the London Musical Times, the Mozart-Jahrbuch (Salzburg), and fifty books, among which is his thirteen-volume History and Literature of the Wind Band and Wind Ensemble and an eight-volume series on Aesthetics in Music. In addition to numerous modern editions of early wind band music his original compositions include five symphonies.